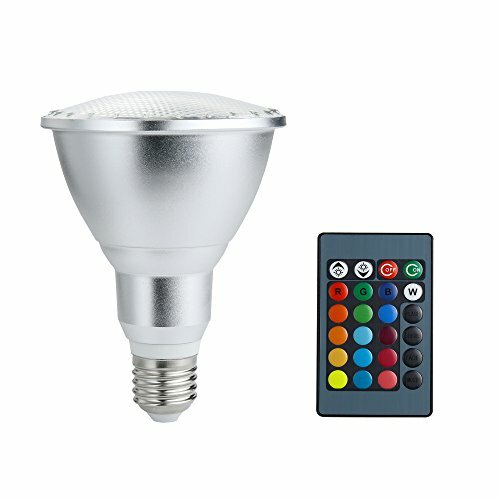 LMCO LED Floodlight E27 10W Color Changing Light Bulb PAR30 RGB Dimmable Indoor Outdoor Lamp with Remote Control for Hotel/Bars/ Home Decoration by LMCO at List It Fort Worth. MPN: LM-SD1030. Hurry! Limited time offer. Offer valid only while supplies last. FEATURES 1. Remote control: Easy to change colors, brightness and modes. The remote controller should be faced to the flood light within 5-8 meters. 1. Remote control: Easy to change colors, brightness and modes. The remote controller should be faced to the flood light within 5-8 meters. Waterproof & Easy Installation: IP65 rating for waterproof. This RGB LED flood lights can be installed easily with E27 socket. Ideal for installing indoor. Memory Function: Remember the color last set. If you set a color, like pink, it will remember that setting. When you turn on this lights next time, it will light on with pink color. Customized Colors Changing Modes: 16 different colors and 4 kinds of color changing patterns. You can set to automatically go through all the colors. If you have any questions about this product by LMCO, contact us by completing and submitting the form below. If you are looking for a specif part number, please include it with your message.